Frome – sowing seeds and seeing transformation in a Somerset Town | Don't mention the M word! Catherine Hill, turning a hill into a talking point and destination area. In 2008 myself and my business partner John Brunsdon were asked to present ideas about place marketing to the Catherine Hill Traders – who were a group of business owners based on and around Catherine Hill, in Frome. At this time Catherine Hill had few thriving businesses, but it did have something special, people with great ideas prepared to come together. We have sat back and watched over the years how a small group of people took on our place marketing principles in Frome and joined up the dots. The results are that Frome’s “place brand” is recognisable throughout the UK and internationally and regularly tens of thousands of people visit Catherine Hill to experience the Artisan Market – seeing Frome as a destination shopping area and much more! These days Frome regularly gets tens of thousands of visitors for it markets and events on Catherine Hill and beyond. How to sell my town – by Tickbox Marketing, 2008. Place marketing is all about people – exciting, enthusing and attracting them to any one place. This is not only about attracting new people to a place, but also engaging with local people and internal investors. The starting point for marketing your town is to create a positive perception in the eyes of your target audience and ensuring the reality meets those perceptions. To define the question more clearly – why place marketing for Catherine Hill? Catherine Hill has a combination of advantages and disadvantages that make it an ideal location for place marketing. 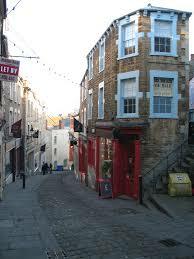 Some of its disadvantages are immediately obvious – it’s called a Hill for a reason – its location gives it an immediate geographical disadvantage compared to its more obvious “competitors”, Cheap Street for independent shopping and the high street for clothes, toys etc. People need a reason to go to Catherine Hill – and any place marketing project needs to be based around creating this reason. However, the advantages it has – while less obvious – are very strong. In fact it has the two things that are absolutely essential to successful place marketing – partnership and a genuine sense of place. Marketing can ultimately only work if it is selling a reality – and that reality needs to meet the needs of the people it is being sold to. And it has the partnership – the Catherine Hill Traders Association, arts and community groups. Marketing a place is not just about talking to external customers, its about ensuring the internal partners have a collective vision of what the place should be and work together to ensure that the message being sent to external customers reflects the reality of what is happening on the ground. How does place marketing work? To begin with you need to have a shared vision, ensure you work with a wide range of different partners and interested bodies and have an effective and long term marketing strategy, involving both on-line (web) and off-line (more traditional marketing methods other than web). The people who live and work in a place – all of the people – are the ones who define the image of the place – or at least acknowledge and agree to it. That image won’t work if it is a short-lived marketing generated image – it needs to be a sustainable positive perception of the place generated by the people in that place. If any place marketing campaign is to be successful, it needs you – the people who define the place – to be ambassadors for the brand. Define what your offering is – then ensure that you carry that definition through in all your marketing – from your own advertising to the way you interact with your customers and your Catherine Hill partners. You can find a successful example of this in Cardiff. Cardiff has a number of Victorian arcades which suffered from some of the same geographical disadvantages as Catherine Hill – they were somewhere you had to go to, rather than somewhere you naturally went, and they were mainly occupied by small independent traders. Most people who went shopping in Cardiff stuck to the high street, or the big department stores. The arcade owners got together, and created a partnership which worked with the local tourist board, local authorities and business organisations to actively promote the arcades as “shopping destinations” – making a virtue of their independence, their architecture, their sense of destination. They came up with a brand for the arcades which was sold on by everyone – if you picked up a bag from one of the shops, as well as its own logo it would have the Cardiff Arcades logo – if you bought clothes in one store, they would recommend accessories in another, or tell you where you could get a great cup of coffee. The result is that the arcades are now some of the most popular shopping streets in Cardiff, and some of the stores are now as well known as department stores that they were failing to compete against previously. Where the Cardiff Arcades succeeded was in not narrowing their place marketing down to just themselves – their success came out of being part of a larger offering, tying in with and feeding the overall marketing of Cardiff as it moved from being a capital in name only to being the international city it is today – they positioned themselves as one of the shopping “crown jewels” of a city being sold as a whole as it repositioned itself in its role as the centre of a resurgent Welsh economy. Similarly, Catherine Hill can only really sell itself as an important part of an overall offering of Frome, Mendip – even Somerset. Frome has a lot of selling points which, at the moment, aren’t being sold. It has a visible history of artisan excellence which is carried through to today with its diverse range of world-class jewellers, glassmakers, artists etc. We would encourage you to engage in any place marketing scheme with other businesses in Frome, with Vision for Frome, with the tourist board, Mendip District Council, Mendip Business Life etc to at least begin a repositioning of Frome based on its real competitive advantage – of which you are a part. Frome has a lot in common with an area which provides one of the most successful examples of modern place marketing – Birmingham’s Jewellery Quarter. Like Frome, the Hockley area of Birmingham had a history of quality artisanship, and a number of existing businesses based around the historic skills in the area. Hockley had declined dramatically up until the 1980s, and also suffered from being part of an overall brand – Birmingham – that did not have a great tourist appeal. The businesses in the area recognised that they had an offering – just as you have – that had not only a reality behind it (the genuine quality of work and the history of the place) but also a real market value – high quality, prestige goods which appealed to a demographic with high disposable income. Working in partnership with Birmingham City Council, the British Jewellers Association, Business Link and other public and private bodies, they re-branded the area by resurrecting its old name as “The Jewellery Quarter”. The businesses tied themselves in with the tourist attractions – the museums, the historic walks, the galleries – to make themselves part of the overall offering. What the businesses did was to let everyone know they were “The Jewellery Quarter” – from brown Heritage signs saying that, to incorporating the brand into their branding. Because it was a reality they were selling, telling enough people enough times that they were “The Jewellery Quarter” made sure that that is what they became. Now the Jewellery Quarter is not so much a brand as a place name, and the area attracts not only substantial national and international tourism, but more and more high quality businesses who want to be associated with the brand, not just jewellery shops but cafes, restaurants, clothes shops and more. Co-ordinating your marketing can help you reach more of your target customers as well as save you costs. The web is one very important way of reaching a local, national and international audience. Most businesses now recognise the power of the web as an advertising and marketing tool and will have a website. The beauty of the web is its inherent ability to work with cross-marketing – one of the key strategies for place marketing. Promoting your brand via the web gives you the ability to promote the individual brands within the overall offering – and on the other side to easily link up with other larger partners, business and tourist websites, Mendip Business Life, Visit Somerset etc. To reinforce the place proposition (vision/brand etc) it is essential to tie up your PR, events, advertising and web marketing – a website plays a centre role to this.